Plesiosaurus was strictly a marine creature from the Sauropsida sub category, although a study by William Conybeare made the claim that it was more of a reptile than a mammal. 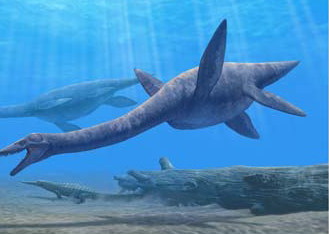 The Plesiosaurus and the Ichthyosaurus have been found in the same area of the Lias of England and Germany . It was first discovered by Mary Anning in 1821. It is known from several almost complete skeletons found over the years. The Plesiosaurus has a small head, long slender neck, a turtle like body, short tail, and paddles as opposed to arms and legs. The Jaw of the Plesiosaurus was able to open very wide and had a lot of conical teeth that were in sockets. The vertebrae of the animal were flat-ended which means that it seemed to been very stiff necked.